The master plan can support more than 1 million SF. The nine-story, high-rise centerpiece of the campus contains the executive offices, standard open offices, and amenities such as a full-service cafeteria, fitness center, and executive briefing center. Profile: The new three-building, 555,000 SF, corporate campus features a Data Center, offices, and test laboratories. The Corporate Center brings together many research and development disciplines at one location creating a synergistic environment for enhanced communication and collaboration between the various business groups. Leading edge research and development is underway in Voice over IP (VoIP), fiber optics, digital broadband software, and network management systems. The new facility houses a 6000 SF Data Center and 1000 SF Server Room. 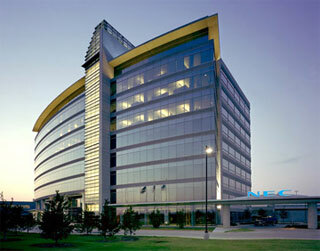 Services: The infrastructure design included 23 telecommunication rooms and computer equipment rooms supporting high-speed distribution throughout the facility. State-of-the-art air-blown fiber, coax and copper connectivity were utilized for "plug and play" functionality for 50+ laboratories and more than 5,000 workstations. The laboratories required special power distribution and custom equipment layouts.